2.3 In addition to the charges specified in section 2.2, the Customer will also have full responsibility for the payment of and shall pay, any and all fees charged by the Disseminating Parties for the market data (“Source Fees”). Vela reserves the right to charge an administrative fee related to the collection and remittance of such charges. 2.4 Customer may not modify its usage type (as set forth in the Order Form) without 30 days’ prior written notice to Vela, and any costs to modify incurred by Vela shall be at Customer’s expense. 2.5 Customer is responsible for its non-display usage being pursuant to, and in conformance with, an agreement with each applicable Disseminating Party, and Customer shall hold Vela harmless for any non-conformance by Customer or its Users with such agreement with any Disseminating Party. 2.6 Customer is responsible for ordering their own cross connects, the cost of which are not included in the Order unless expressly referenced. Each cross connect is solely to be used for connectivity into the Vela environment. Customer acknowledges that latency or delivery for internet-based connectivity cannot be guaranteed to the same standard as dedicated connectivity. 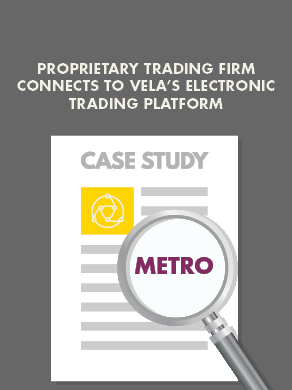 Vela reserves the right to immediately disconnect Customer Internet VPN connections if connections, in Vela’s sole opinion, cause (i) a material delay to Vela’s TCP publishers; (ii) a negative impact to the performance of Vela’s environment; or (iii) negatively impact the Vela environment for Vela’s other clients.